Forecasting payrolls growth is always more luck than science, but there is even more guesswork than usual this month. That’s because there is a double Hurricane effect to take into account. September’s payrolls figure of “just” 134,000 was clearly depressed by Hurricane Florence, which prevented thousands of workers in the Carolinas and Virginia from getting to work. This month there should be a clear rebound in the region with additional jobs created thanks to the rebuild/clean-up operations put in place. However, Hurricane Michael, which hit Florida and Georgia last month, will have had a detrimental impact on payrolls in that region through worker absence. As such, markets should refrain from placing much emphasis on the actual outturn. For what it is worth, we are forecasting payrolls growth of 200,000, but to be honest, anything could happen – the range of economist forecasts is 105,000 up to 253,000, according to Bloomberg. Irrespective of the outcome, the underlying story is one of strength. Payrolls growth has accelerated from an average of 182,000 per month in 2017 to 208,000 per month in 2018 – even after last month’s soft figure. The economy is booming and the bigger struggle for companies is actually finding labour to fill their vacancies. Note that the National Federation of Independent Businesses reports that the proportion of small firms that are unable to fill their current vacancies is the highest it has been in the survey’s 40+ year history. Pay rates have been grinding higher, but we expect to see a real breakthrough this month. The annual rate of wage growth is set to push above 3% year-on-year for the first time since April 2009. In fact, we expect to see a 0.3% month-on-month, 3.2% YoY outcome. 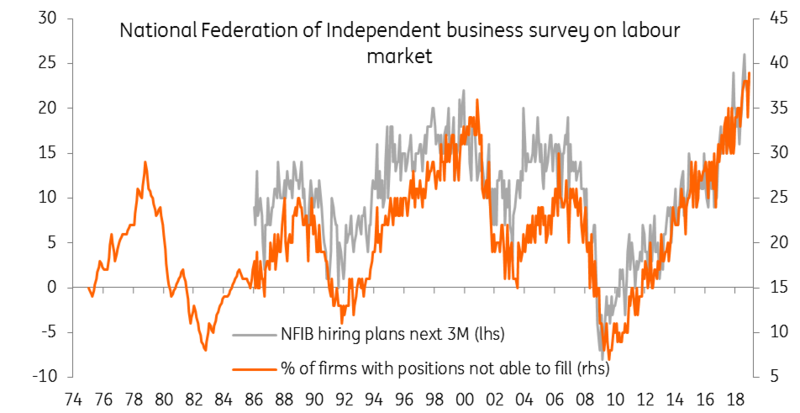 The NFIB survey above shows that the proportion of small businesses looking to raise pay is also at the highest in the survey’s long history, which shouldn't come as a surprise given the tightness in the job market. The household survey used to generate the unemployment rate tends to be choppier than the payrolls survey of employers, but the consistent theme of ongoing healthy job growth is clearly evident here too. We look for the jobless rate to drop to 3.6%, which would be the lowest rate since November 1969. Underemployment is also likely to fall in this strong growth environment at a time when the participation rate in the jobs market is stagnant. The US economy continues to grow strongly and with the job market continuing to tighten, there is growing evidence of pipeline pay pressures. Inflation is already above the Federal Reserve’s 2% target on all the key measures the central bank follows and rising wage growth will only add upside risks for inflation. 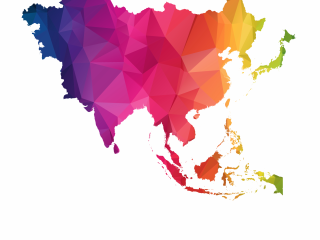 As such, the Fed looks set to remain in tightening mode with a December rate hike looking probable followed by three more 25 basis point interest rate rises next year.